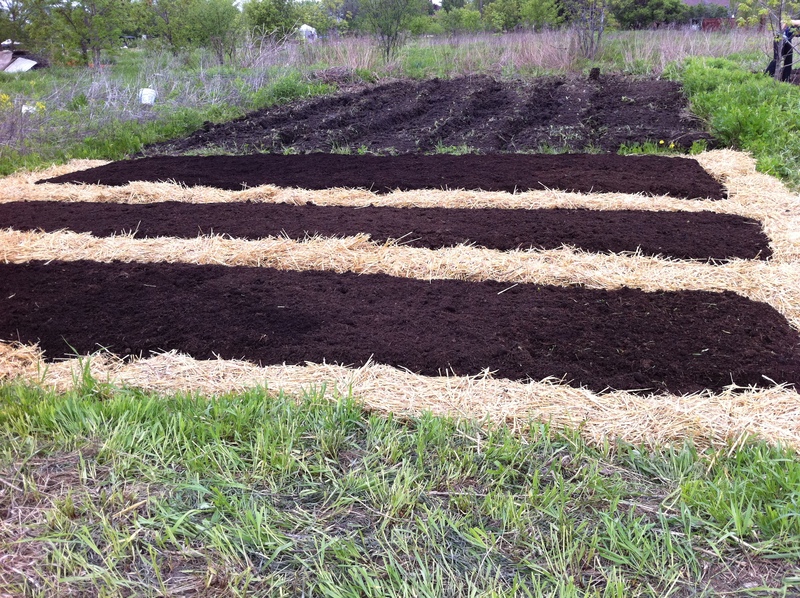 No real surprises; I figured after turning the soil by hand that the weeds would still try to find a way to come up. But the water! Holy Never-ending Flood Batman! 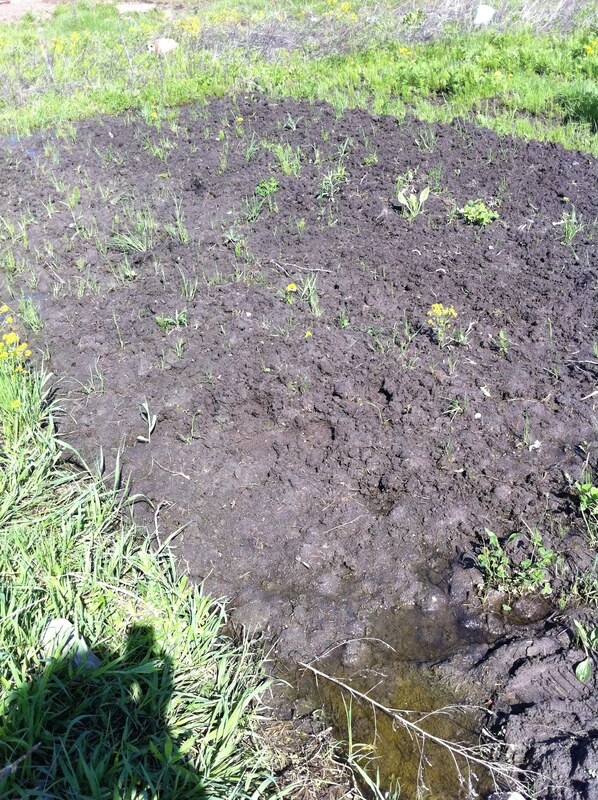 Is this garden plot ever going to dry out? 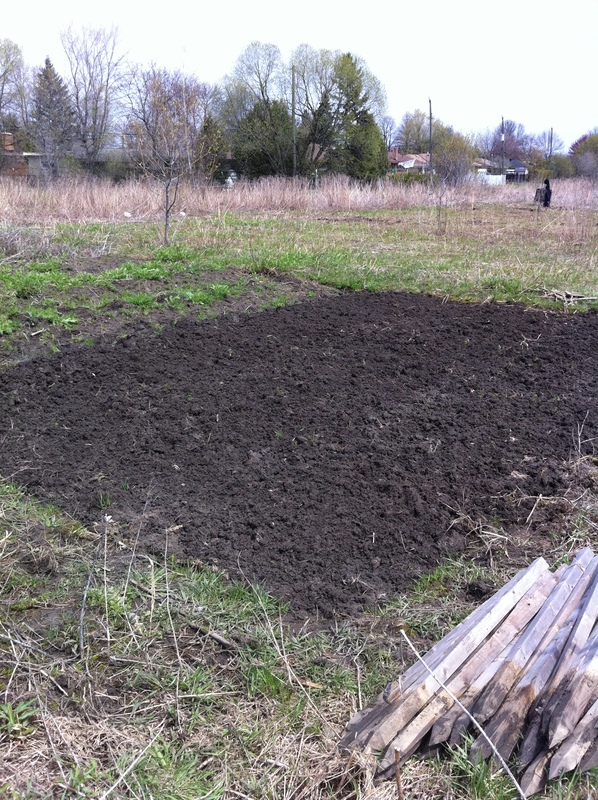 No, not the cleared part — that’s our plot — but the weedy patch immediately to the right! 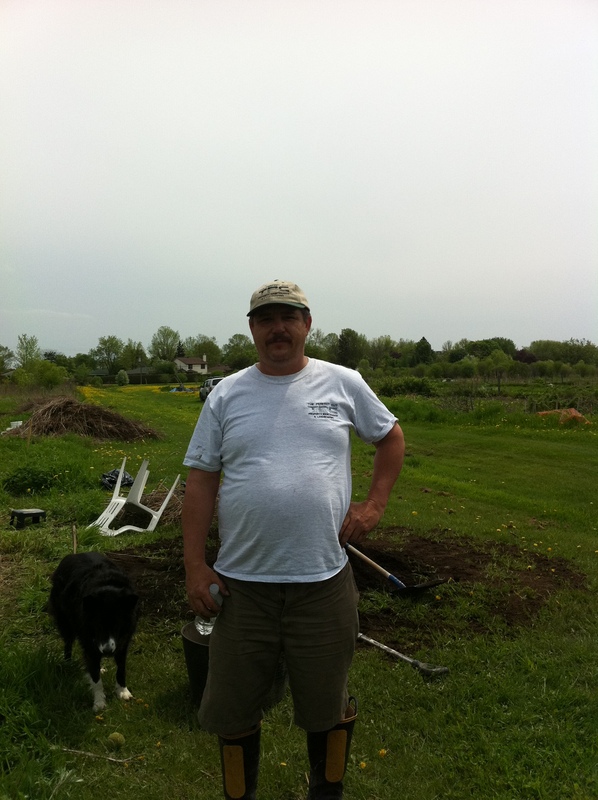 So we shovelled and shovelled and shovelled…. AND it was HOT! Then we realized that the paths between the beds were still too wet and we needed to cover them with something that we could walk on. Straw! Off we went to get four bales. 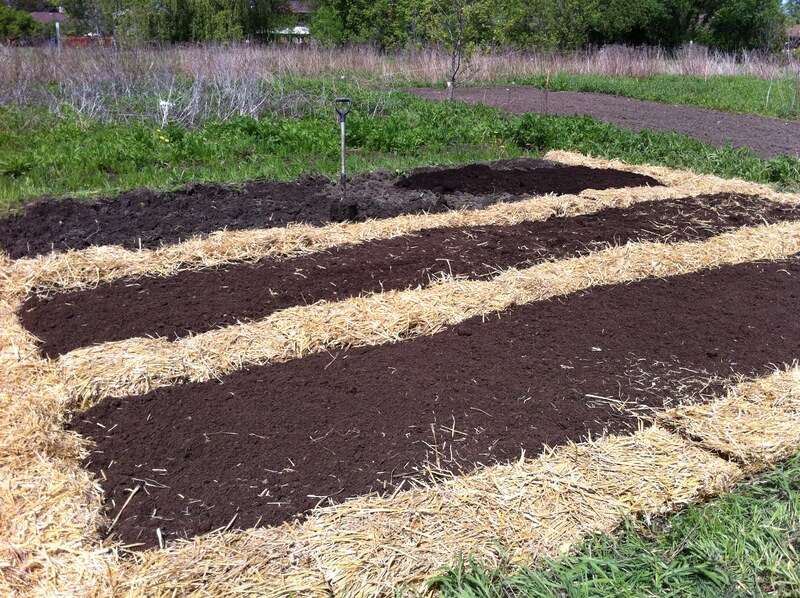 And in no time, we had made three beds with straw paths in between. 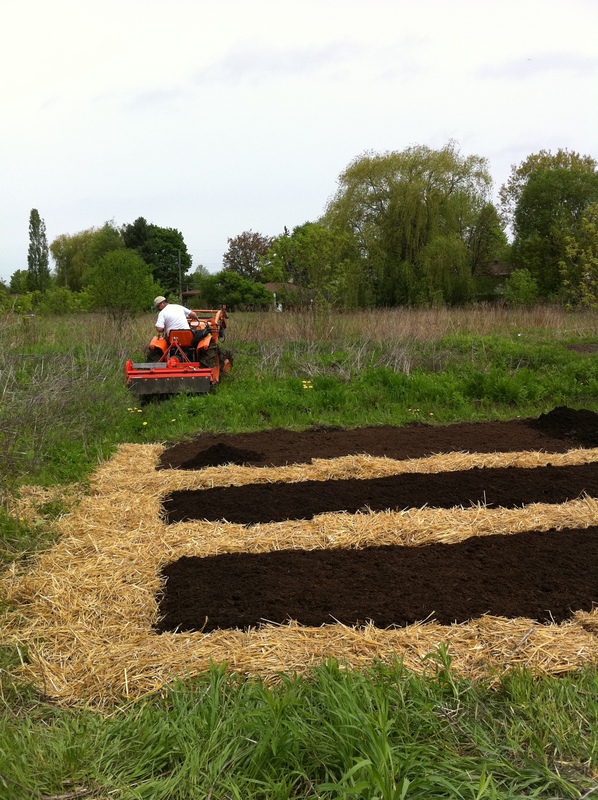 He only did one pass since the soil was still too wet. 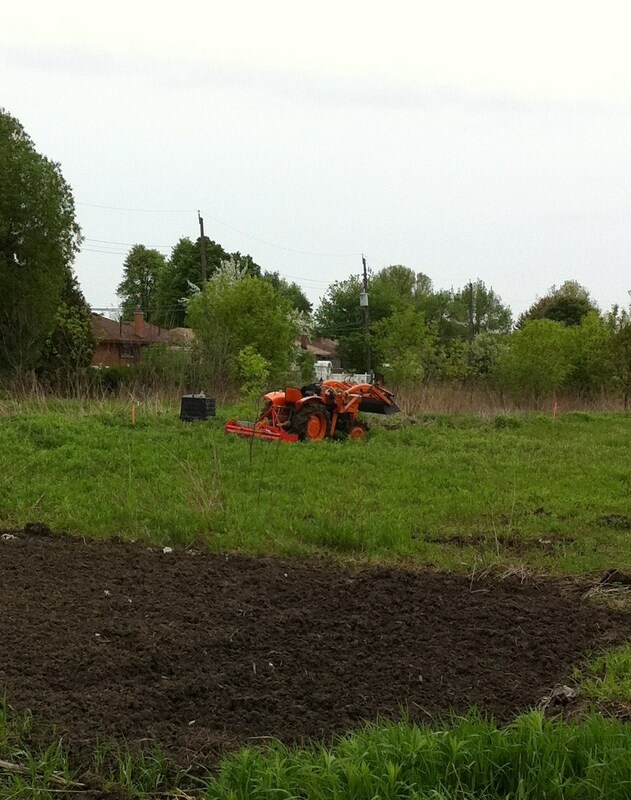 Big honking clogs of soil were threatening to jam up his tiller. 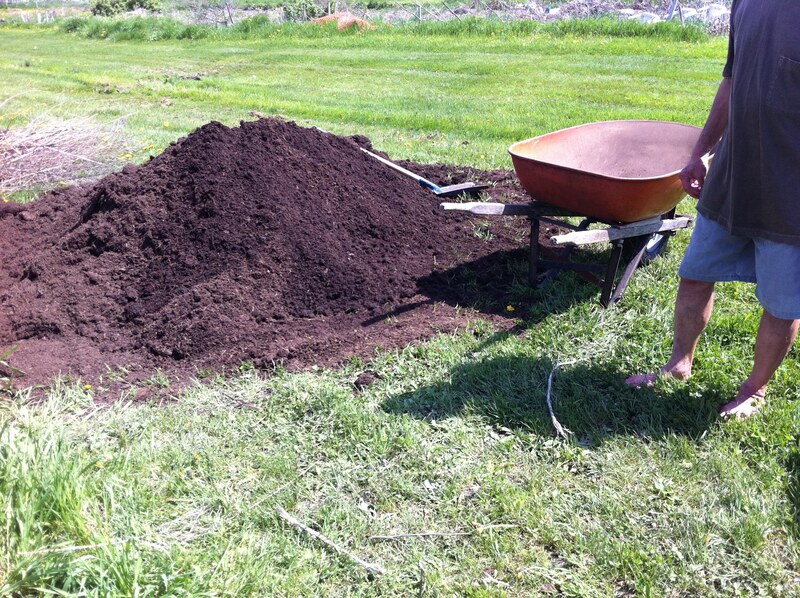 But it sure beats hand digging! I’m so excited. 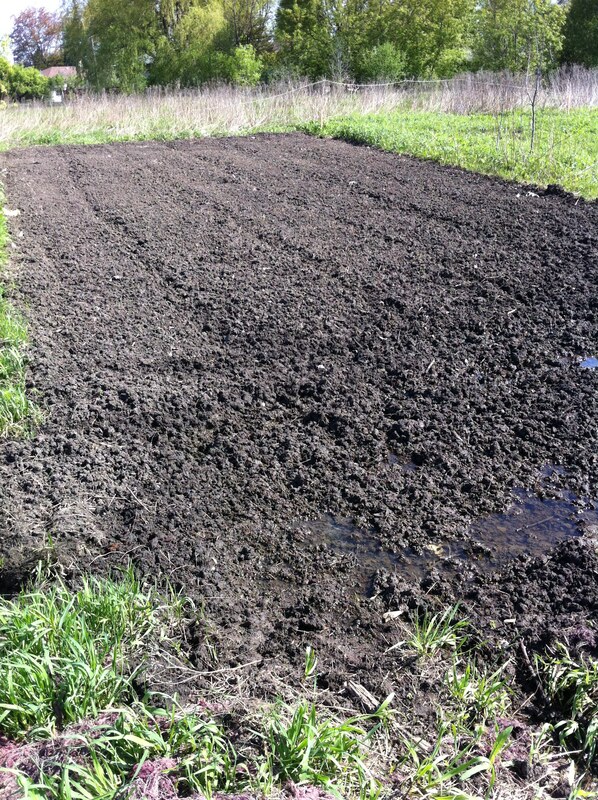 We went back today and under the threatening sky planted our first crops. 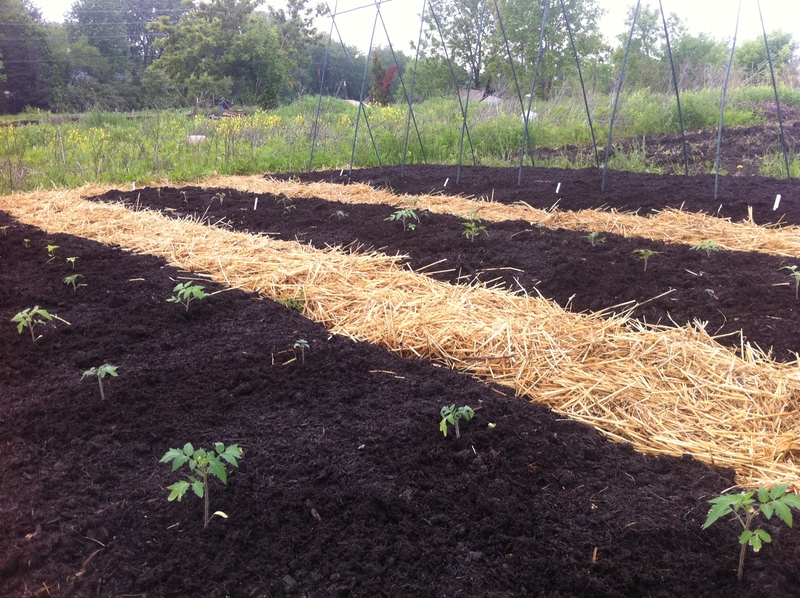 Tomatoes, peppers, broccoli, onions, snap peas and we’re giving colourful sweet peas a try. 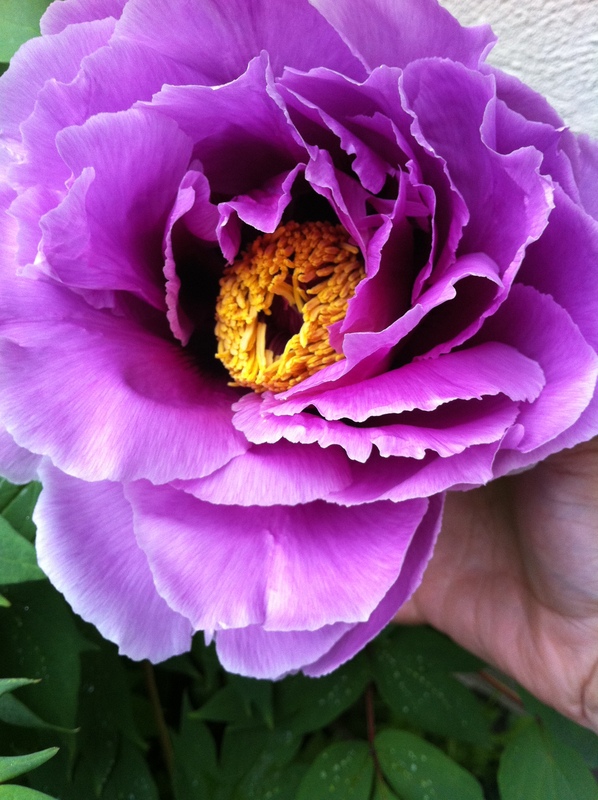 May showers bring June flowers! 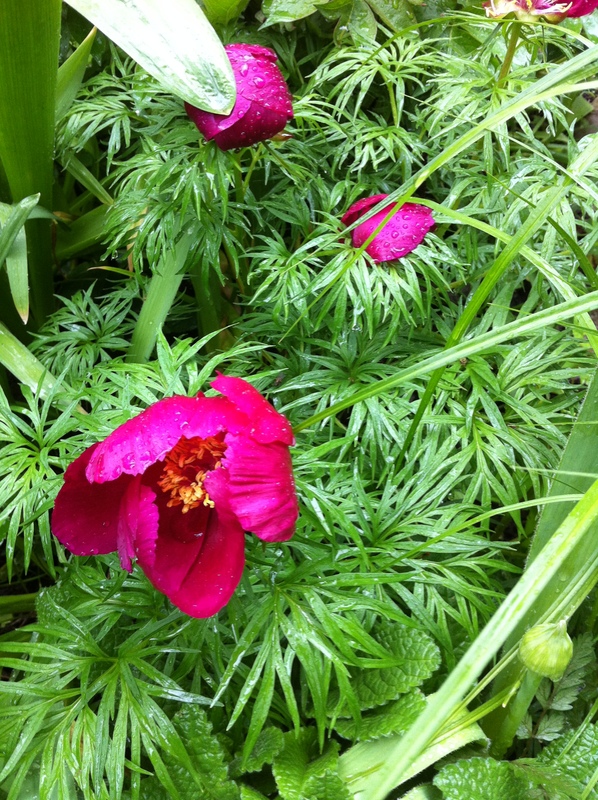 We’ve had such an incredible amount of rain this spring my garden is threatening to become a jungle before I’ve had a chance to get out there and edit the weeds! 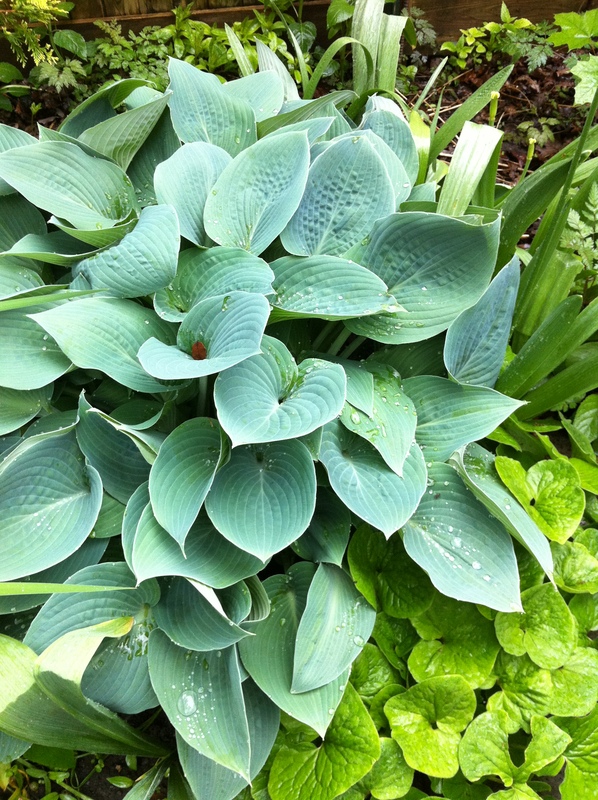 This is Hosta ‘Halcyon’ — such an impossible blue! With Asarum canadense (Canadian Wild Ginger) nudging up against it, trying to get in the shot. You can see everything is very lush and early for the last week in May. 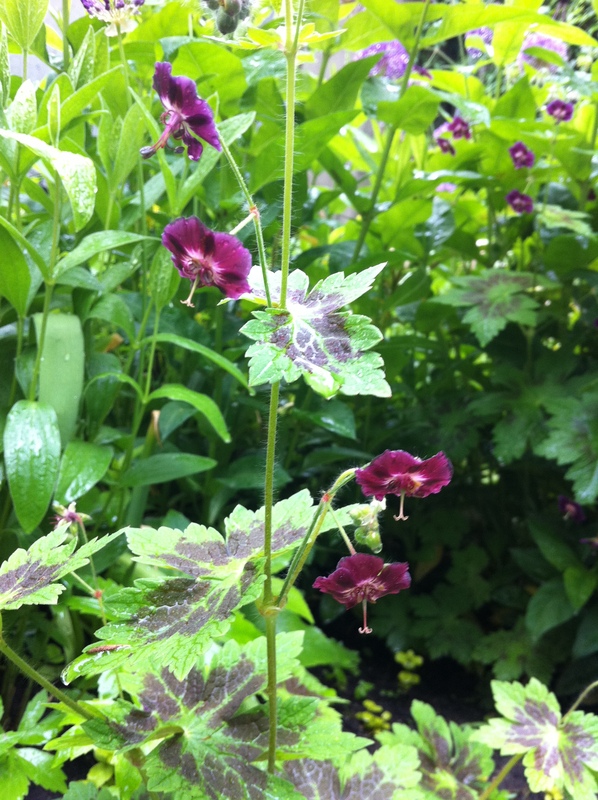 Speaking of notorious — this demure looking cranesbill (Geranium phaeum) is nothing if not insistent. Gorgeous here but beware! 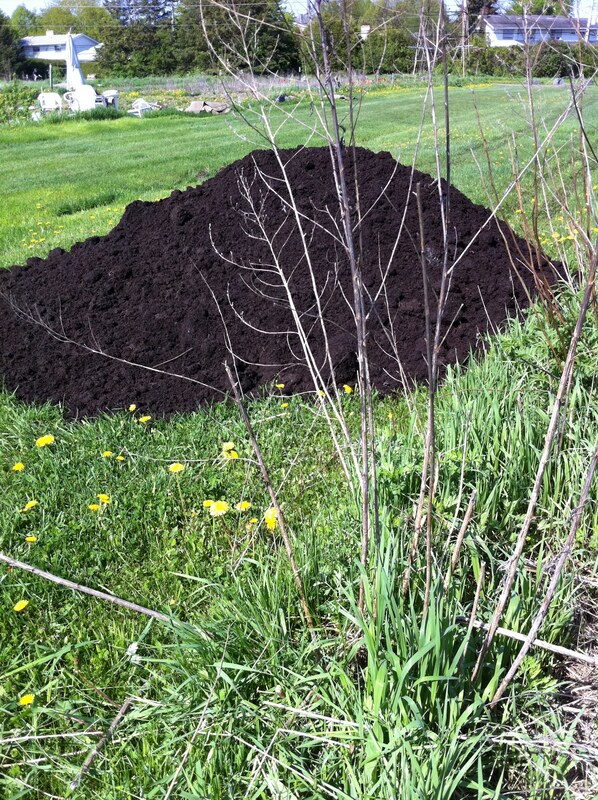 It will easily over-run your garden if you don’t pay attention. 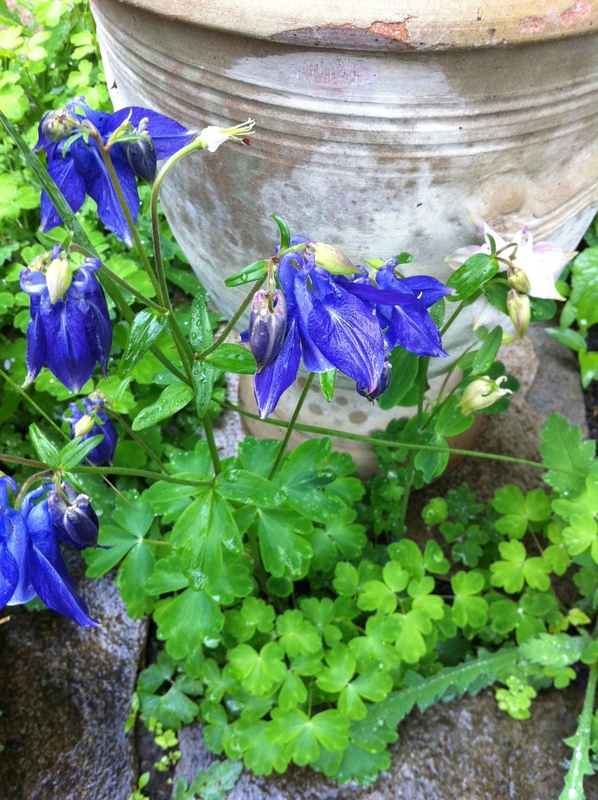 And it is also one of those varieties that acts as a flag — that is, it will droop and fail in the summer heat, so put it in afternoon shade if and keep it there if you adore the distinct blooms and blotched foliage. 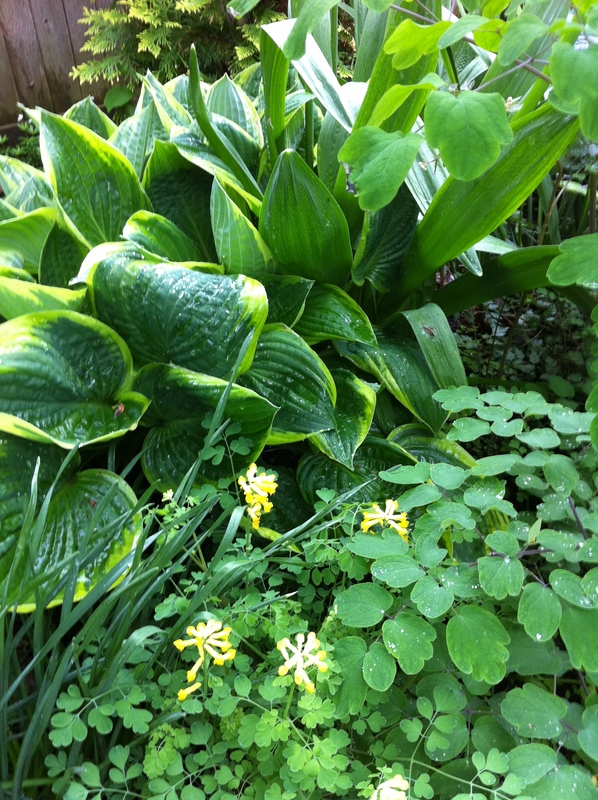 I don’t recall the name of this hosta but the other players include Corydalis lutea (Yellow fumitory), a golden-tipped cedar in the background and the emerging stems of ‘Hewitt’s Double’ meadowrue (Thalictrum delavayi ‘Hewitt’s Double’) that will soon dwarf everything in height, but not in texture. Yikes! Is this snow in May? Perhaps the prediction for the end of the world on May 21st 2011 was really all about this…. 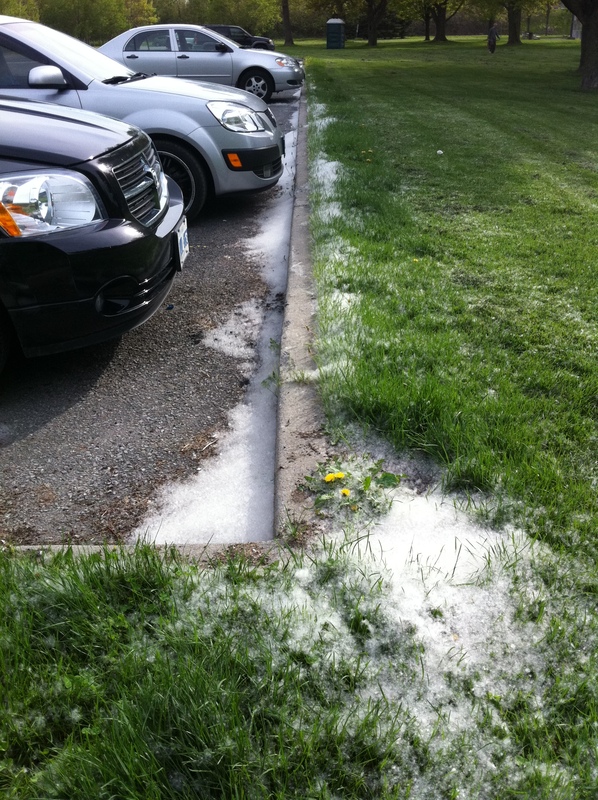 No — although it looks like it, it’s actually not snow. It’s Aspen fluff! The female trees of the genus known as Populus (known as Aspen, Poplar or Cottonwood) all spread their tiny seed in clouds of fluff. Light as air, they burst forth in May and travel by wind, creating ever widening stands of these short-lived trees. Aspen (often called ‘Quaking Aspen’ — Populus tremuloides) is one of the most important species of tree in the boreal forest, providing habitat, food and protection for many varieties of insects, small mammals and birds. Although they are not trees commonly used in ornamental landscapes (it’s even hard to find aspens at the nurseries), they are often planted to act as fast-growing windbreaks in farmers’ fields or statuesque focal points in public parks (although other trees, like fastigiate oaks, might be a better choice for the latter). It was about 1 1/2 inches in diameter, orange and gelatinous: yuck! I was doing some planting and when I turned around to see what was brushing against my head I saw this. 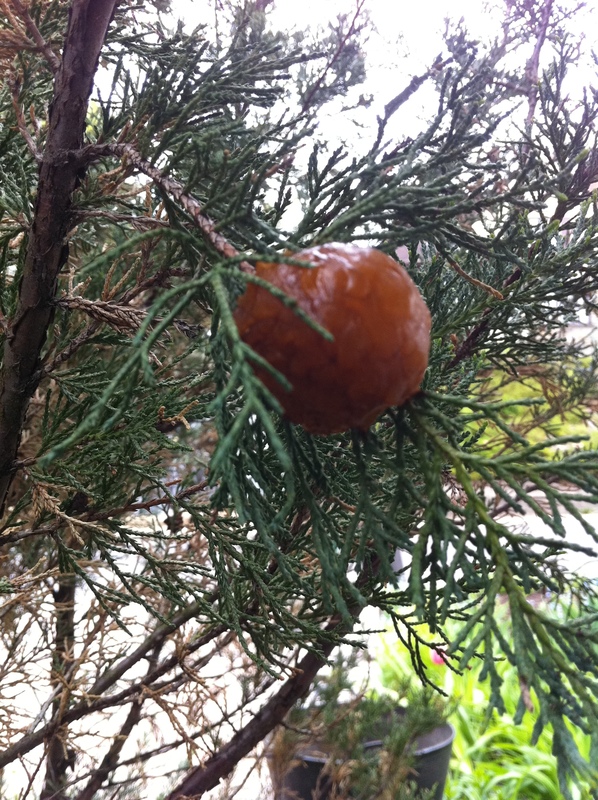 This amazing sphere is actually a fungus called Gymnosporangium juniperi-virginianae, and it is what causes Cedar-apple rust. This so-called ‘rust’ causes the orange spots you see on apple leaves, causing leaf drop that can prematurely defoliate trees and potentially weaken them (not to mention de-face the apples themselves). This fungus (one of several rust diseases in the genus Gynosporangium) needs both a Rosaceous and Juniper (known as ‘red cedar’) host to complete its life cycle. The gelatinous fungus that is pictured here has emerged from a dry, woody gall that protected it through the winter months. 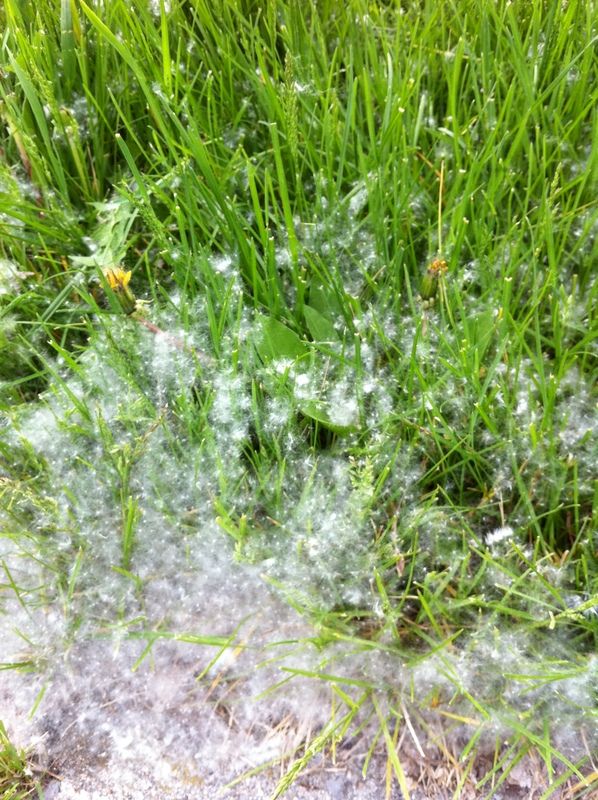 When the spring warmth and moisture begins, the fungus is activated and takes on its crazy appearance. 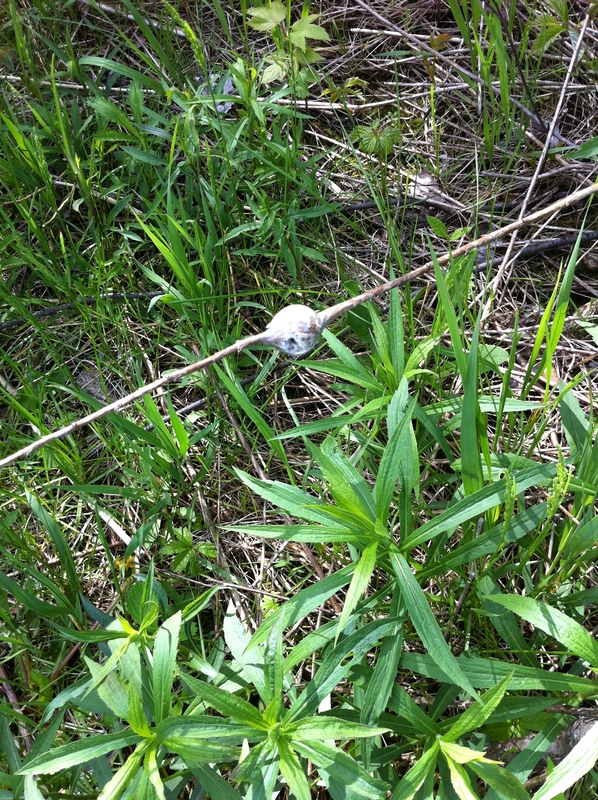 ASIDE: You will have probably seen this spherical growth on goldenrod plants. It is not caused by a fungus but rather by the goldenrod gall fly, whose life cycle is entirely dependent on this native plant and is described here. Once you see this squishy orange stage of the fungus on juniper plants, the sphere is about to morph to include horn-like growths. These will release spores that travel on the wind to their companion apple host (which could be miles away), where the cycle will continue. The accepted control for the home garden is keeping an eye out for this brightly coloured fungus, choosing not to grow apples and junipers near eachother and growing rust-resistant varieties of both plants. *Love* this video. Perfect script and timing. 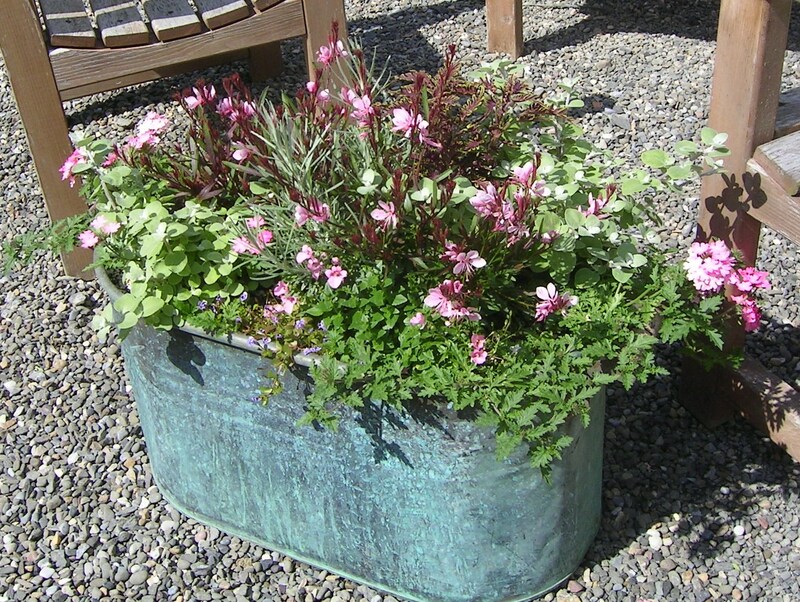 This effusive display is crammed into a copper bin that has turned a beautiful verdigris colour. Pink Gaura lindheimeri, Helichrysum petiolare ‘Limelight’, trailing verbena, a pink diascia and Helichrysum ‘Silver Spike’. This planter was a feature down in Hudson, New York, while we were there visiting Margaret Roach’s garden. 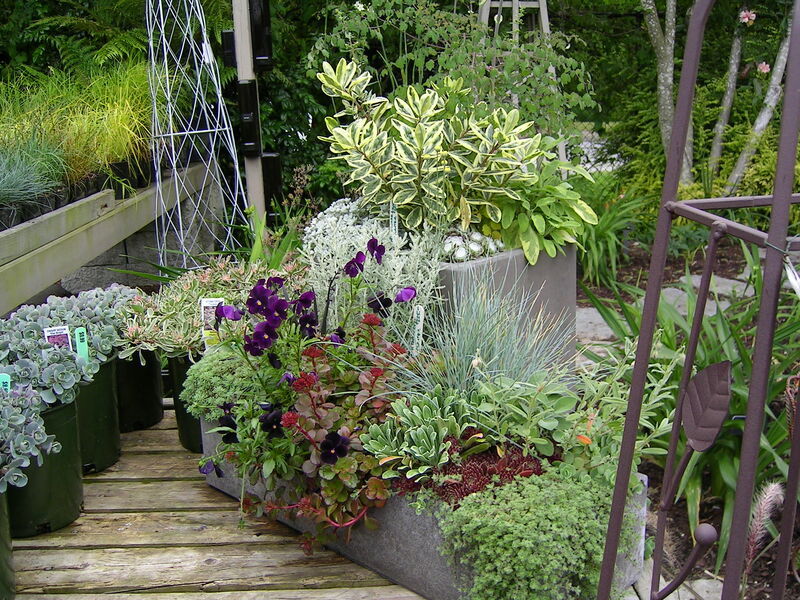 Scale is one of the most important considerations when you’re designing a container garden. 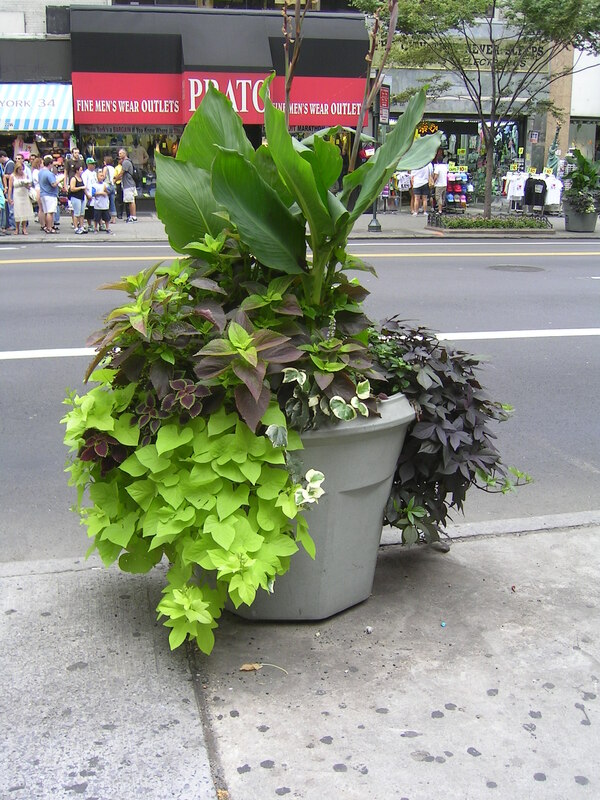 Don’t shy away from monumental plants like this canna in the centre of a downtown Manhattan planter. 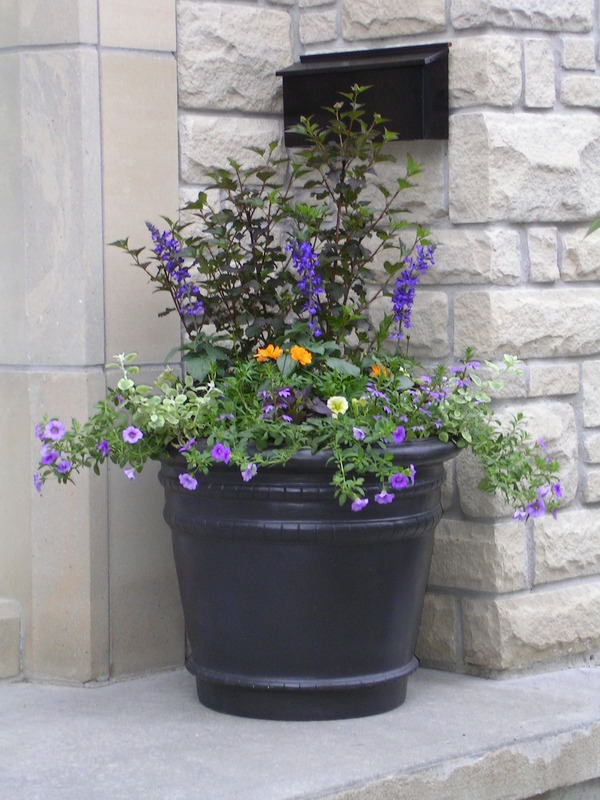 Similarly, a front door planter needs to have enough ‘oomph’ to make a statement at your entrance. This one includes a purple-leafed ninebark shrub as its centrepiece. This planter shows how important it is to match the plants with the container. It doesn’t hurt when you have a spectacular glazed pot like this one. 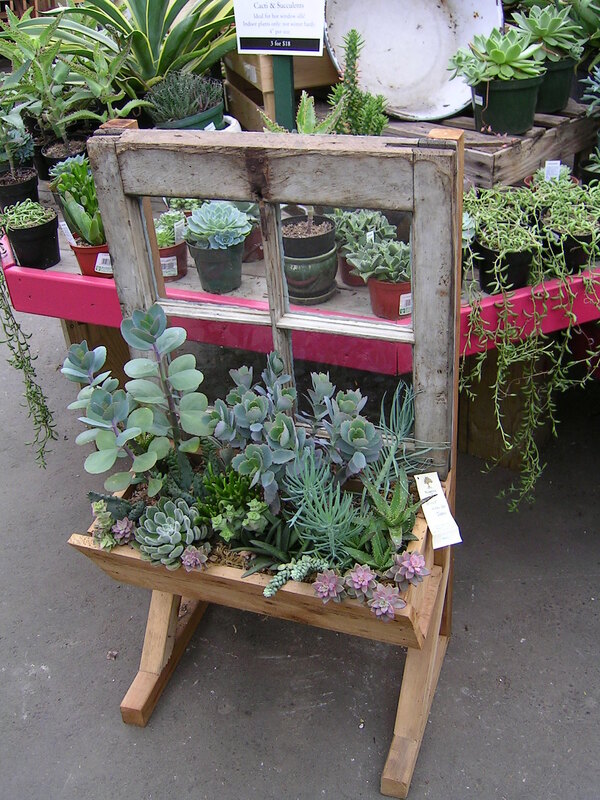 Of course, anything can be a container – even this free-standing and creative display. 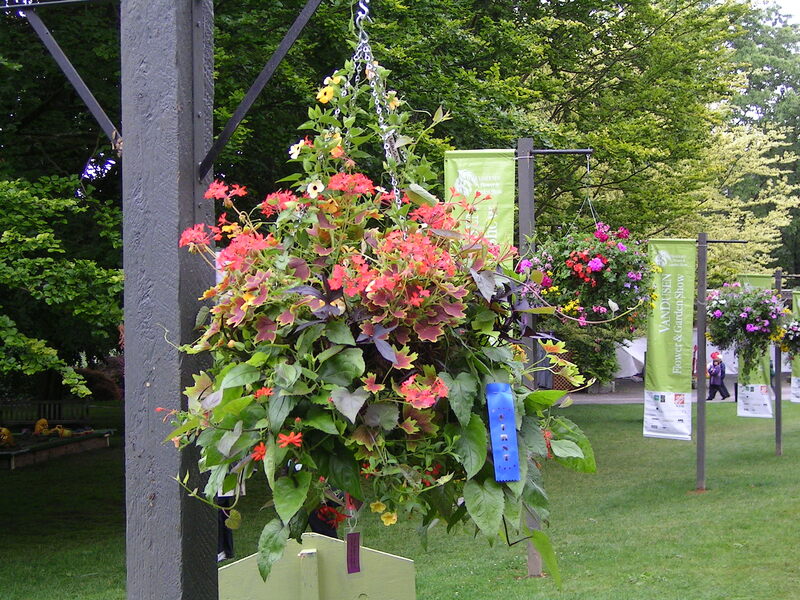 Hanging baskets have to be full of cascading plants. They should grow into eachother and intermingle in such a way that you can no longer tell one plant from another. The best advice I can give you is don’t be timid! And be creative. If it doesn’t work out, take the losers out and replace them with better players. 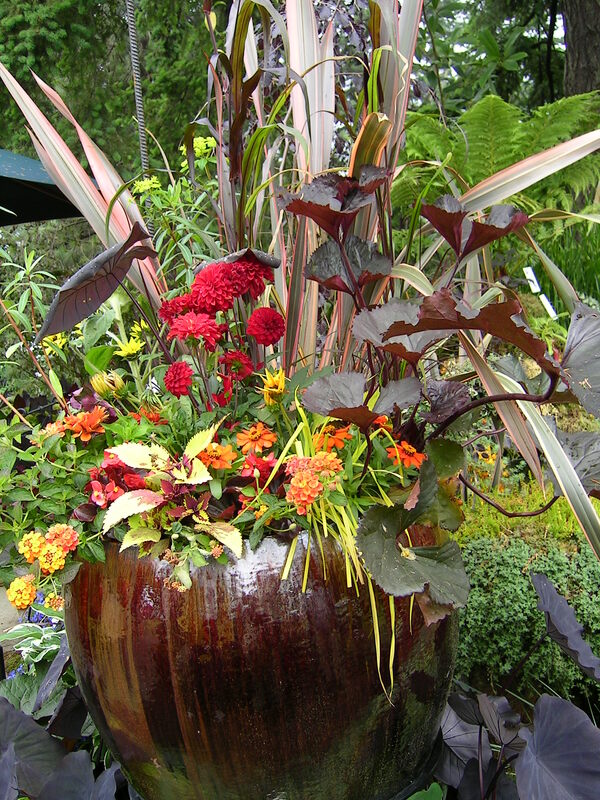 A container should look amazing all season – even if you have to edit and re-arrange to accomplish this.